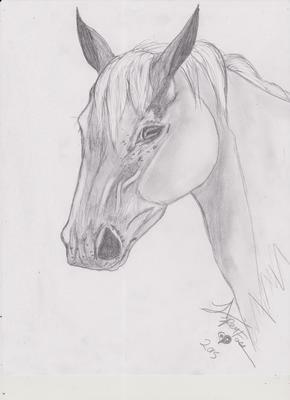 Here are some of my newest drawings I've done over the month of August. I'll tell you a little about them. 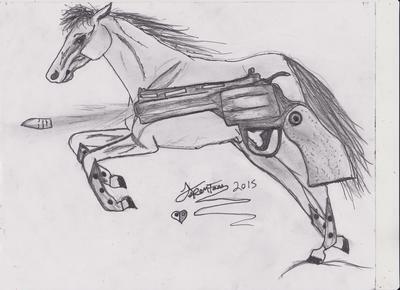 1 - This ain't a horse but it's one of my best human drawings ever! I drew this on August 9th 2016. It all started when one of my friends talked me into drawing this picture of Adam Lambert and I couldn't wait to start it. It took me, believe it or not (it's one of my fastest and best ones), 2 hours. It's all pencil - 6b, hb and more. The only thing in color is his eyes and the background. Please comment and tell me what you all think. 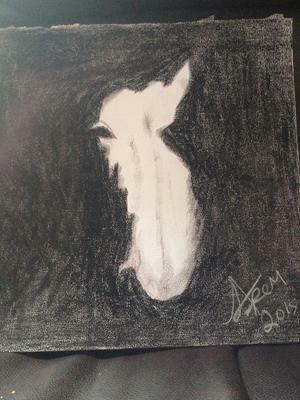 I'd love to hear your opinions about this drawing. 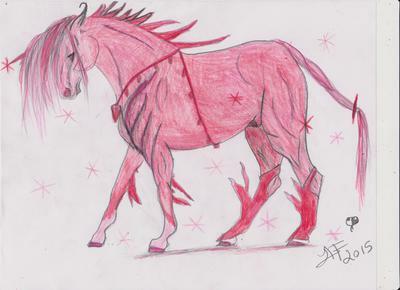 2 - I'm a big fan of the movie the Avatar, the Last Airbender and I couldn't wait but to do a drawing of a fire nation horse. 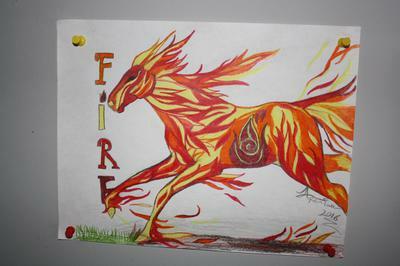 I call him Flames because, well, he's flaming hot. LOL! 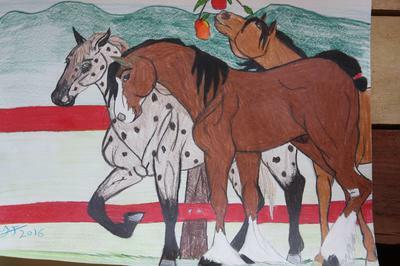 3 - A family portrait of me and my friend's breyer horses - Appaloosa (Buddy the 2nd a.K.A Cody D)and Clydesdale (Buddy the 1st), Buckskin (Tommy Joe trying to grab an apple from the tree! 4 - This one I did on 8/21/2016. 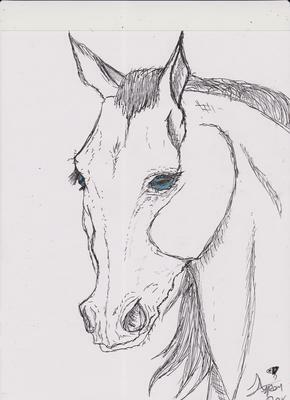 I love how the horse throughout the eyes is just so playful. And actually, this one looks really loving. It's beautiful in my eyes but I would love to hear your opinion. 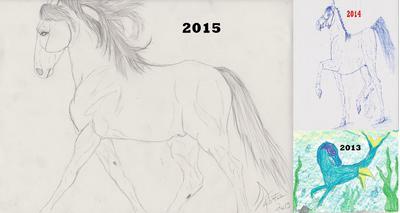 It's done with pencil, all kinds, from HB to a Dark 6B. Please feel free to comment! 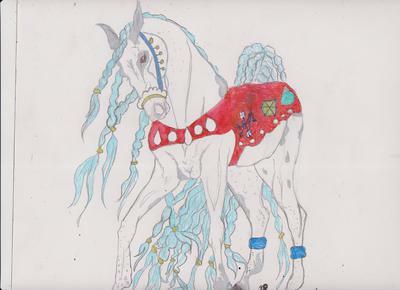 Playful Arabian is a drawing that shows tons of personality. 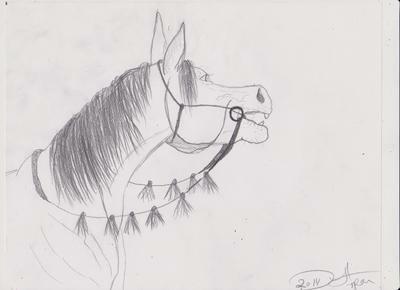 The eyes and the nose is just so powerful, strong and very dominating, the halter shows that this horse is very stubborn with the chains to slow his jets down. LOL! I think I've done pretty well with the shading. You can see every muscle and vein throughout the face. I even had a couple people say that it looks like he's shiny, and that puts a smile on my face. That's what I've always wanted to get when I draw! 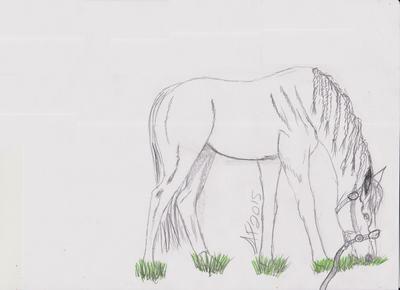 The words down below is a song by One-Republic called Apologize and the horse looks like he's saying sorry. Don't know why but he does. And say.That it's too late to apologize. 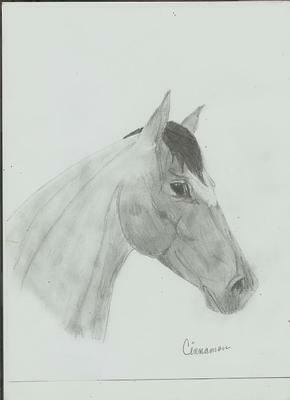 #1 - This horse I drew for a contest but the SAD Thing is I probably will never get this drawing back. 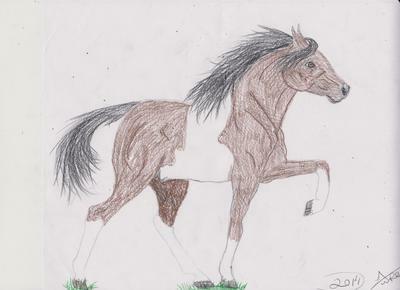 I drew it for a good reason - for the Constitution Day Contest... I hope I win. 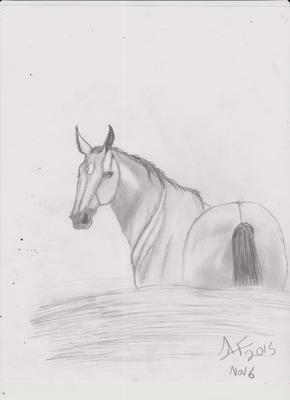 #2 Is not a HORSE but I have been telling people for a long time that I can DRAW people too so here it is. 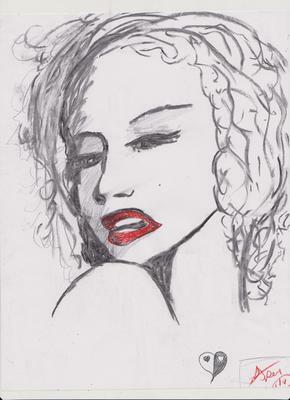 Marilyn Monroe - I drew this last year 2014. When my family saw it they could not believe what I just drew. I made it with light black charcoal and the lip "IS MY FAV PART" - I did it with Kimberly Red Watercolor Pencil..
Hi! 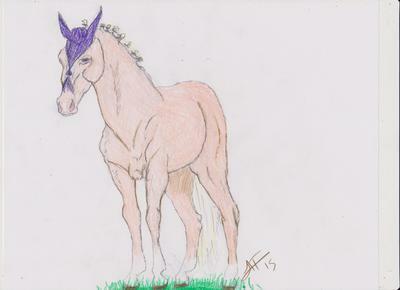 I drew this Palomino colt and another for a song By CARRIE UNDERWOOD that's called (Little toy guns). I did this with a pen if you can believe that. It turned out great but there's one thing that bothers me... it's her NOSE. 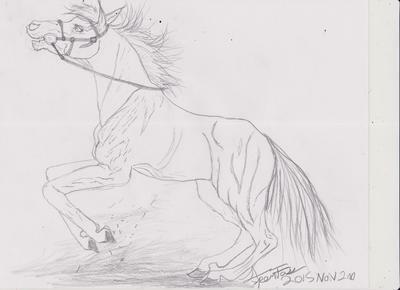 It's a bit small and Arabian-ish but it's still an amazing drawing, don't you think? 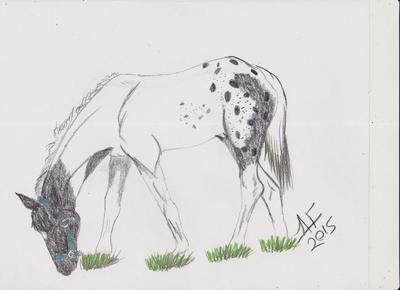 A drawing I did on 4/13/2016. I really hope everyone likes it. Feel free to comment. Thanks! 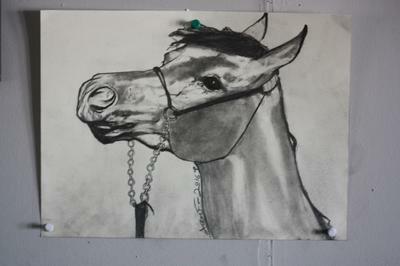 I usually don't use Charcoal but this time I did, and it turned out great saying I used charcoal. I draw really hard with a pencil or colored pencil and I break the charcoal right in two. But this time I light handed everything keeping the charcoal flat and softly on the paper. I did a light grey charcoal in the black, that almost looks like it came right out of the fireplace. But once it got all together it looks good. I do know that my favorite to do is pencil, mostly the darkest 6B to 8B those are my fave and I use them even if I don't need them. Even this drawing has the pencil through it's hair and place that the light is hitting. 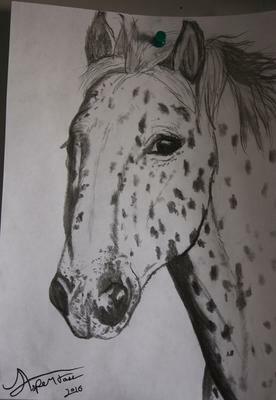 Using pencils and charcoal sometimes don't do good together but it's great for this picture. 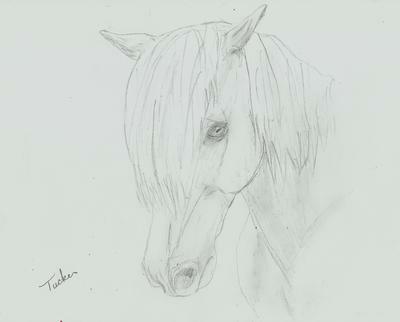 I think it's pretty good, don't you think so?! 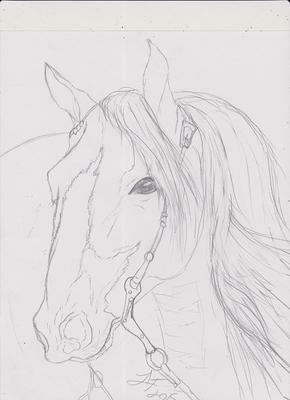 Pencils are all I need/More horse drawings anyone? Pencil's are all I need! 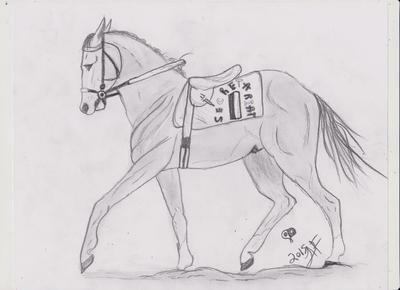 The first one I call Young Arab Horse walking. 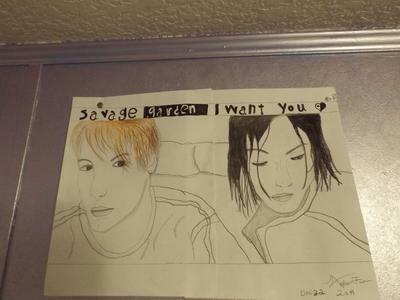 3rd --- One isn't a HORSE, I have talked about Savage garden before. Hope you guys like it! 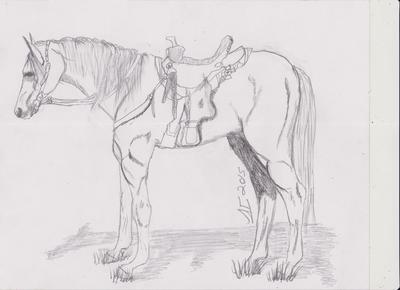 This drawing took about 1 hour to 45 minutes. 4th --- Rubies are RED. 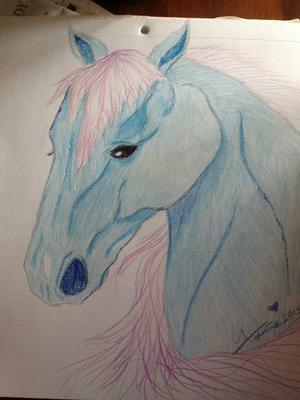 I drew this Horse with colored pencils. I thought it's always good to learn about new things so this is what I have for you. The story of Secretariat began with the toss of a coin in 1969 between Penny Chenery of Meadow Stable and Ogden Phipps of Wheatley Stable. The coin toss was the idea of Phipps, owner of Bold Ruler, and "Bull" Hancock of Claiborne Farms as a way to get the very best mares for Bold Ruler, and when the toss went their way, to add well-bred fillies to their own broodmare band. Bold Ruler was considered one of the important stallions of his time. He had a fine balance between speed and stamina, and though he finished fourth in the 1957 Kentucky Derby at a mile and a quarter, he won the Preakness two weeks later at a mile and three sixteenths, and went on to win three major stakes at the Derby's 10-furlong distance. After his racing career, Bold Ruler was retired to Claiborne Farms, but was still controlled by the Phipps family. This meant that he would be bred mainly to Phipps's mares and that few of his offspring would find their way to the auction ring. Phipps and Hancock agreed to forgo stud fees for Bold Ruler; instead, they would claim one of two foals produced by the mare he bred in successive seasons or two mares he bred in the same season. 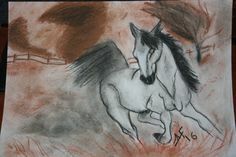 Who obtained which foal or even received first pick would be decided by a flip of a coin. In 1968, Chenery sent two mares named Hasty Matelda and Somethingroyal to Bold Ruler, and in 1969, a colt and filly were the result. Chenery and Phipps's coin toss was held in the fall of 1969, in the office of New York Racing Association Chairman Alfred G. Vanderbilt II, with Hancock as witness. As stated in the original agreement, the winner of the coin toss would get first foal pick in 1969, and second foal pick in 1970. Phipps won the toss and took the weanling filly out of Hasty Matelda. This resulted in Chenery getting the colt out of Somethingroyal. In 1969, Hasty Matelda was replaced by Cicada, but she did not conceive. Both parties assumed Somethingroyal would deliver a healthy foal in the spring of 1970. 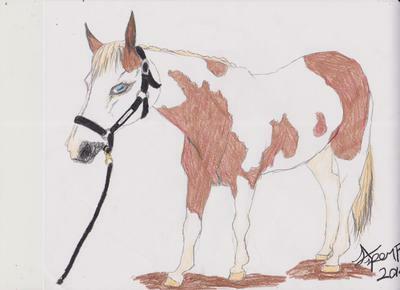 This left Chenery with the unborn foal of Somethingroyal On March 30, at 12:10 a.m., Somethingroyal foaled a bright-red chestnut colt with three white socks and a star with a narrow blaze. 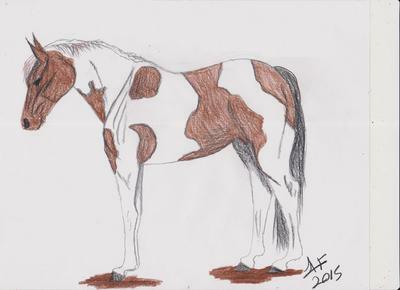 By the time the colt was a yearling, he was still unnamed. Meadow Stable's secretary, Elizabeth Ham, had submitted five names to the Jockey Club, all of which were denied for various reasons. 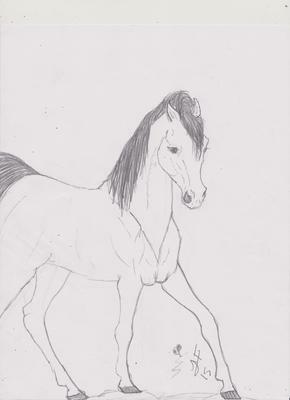 Approval finally came with the sixth submission, a name Ham herself picked from a previous career association, "Secretariat". The Kentucky Derby Churchill Downs bettors made the entry of Secretariat and Angle Light the 3–2 favorite in the 1973 Kentucky Derby. (Sham was next at 5–2.) Secretariat broke last, but gradually moved up on the field in the backstretch, then overtook Sham at the top of the stretch, pulling away to win the Derby by 21⁄2 lengths. 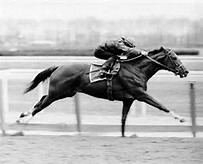 Our Native finished eight lengths further back in third.On his way to a still-standing track record (1:592⁄5), Secretariat ran each quarter-mile segment faster than the one before it. The successive quarter-mile times were 251⁄5, 24, 234⁄5, 232⁄5, and 23. This means he was still accelerating as of the final quarter-mile of the race. No other horse had won the Derby in less than 2 minutes before, and it would not be accomplished again until Monarchos in 2001. 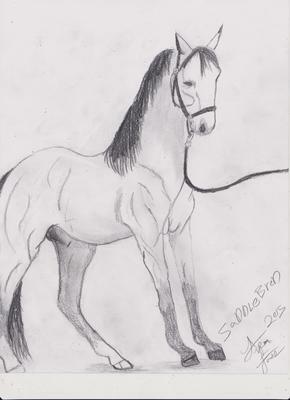 The thing you have to understand is that Sham was fast, a beautiful horse. He would have had the Triple Crown in another year. And it just didn't seem like there could be anything faster than that. Everybody was watching him. It was over, more or less. And all of a sudden there was this, like, just a disruption in the corner of your eye, in your peripheral vision. 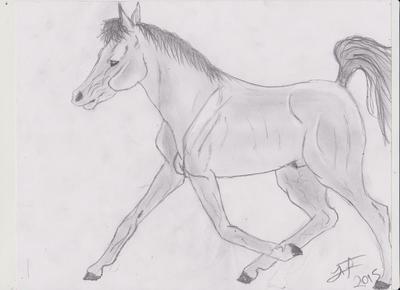 And then before you could make out what it was, here Secretariat came. And then Secretariat had passed him. No one had ever seen anything run like that – a lot of the old guys said the same thing. It was like he was some other animal out there. 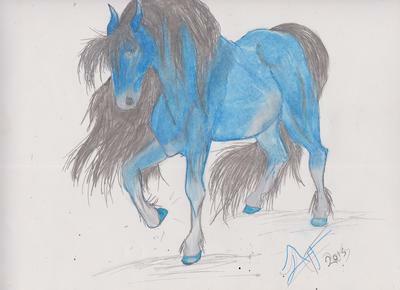 Ol' Blue is a drawing I'd done with colored pencils. Feel free to comment and say what you think. 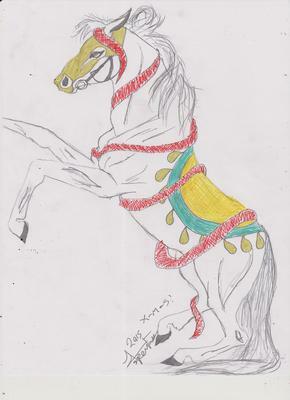 (4)I drawn this beautiful horse named LUCKY ...Lucky you are beautiful ... 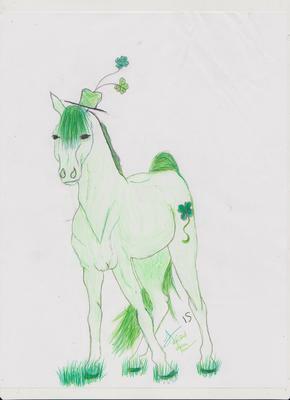 I love sorrel horses ... @*************** you are lucky to have LUCKY!!!! 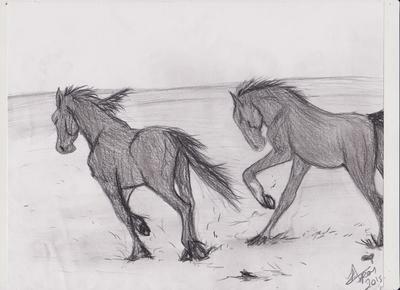 These are two real horses that I love riding. I show Cinnamon western, and do some pasture riding and low jumping on Tucker. ♥ them both so much!!! #1 and #2 - The Arabian horse breed have refined, wedge-shaped heads, a broad forehead, large eyes, large nostrils and small muzzles. They display a distinctive concave or "dished" profile. 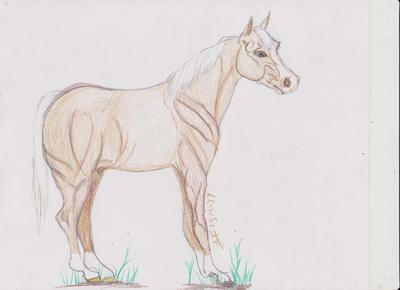 #3 - The American Saddlebred is a horse breed from the United States. #4 - The Icelandic horse is a breed of horse developed in Iceland. Sunset Runners is a drawing I did for a contest where it was a tie between me and this other girl. 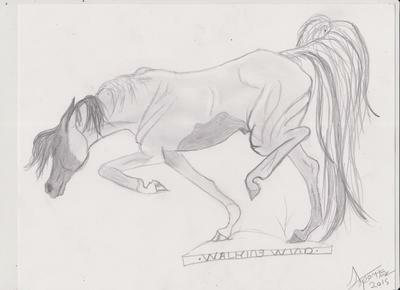 Hers was good and for a while there, I didn't know if I was in the contest but a tie made me happy. 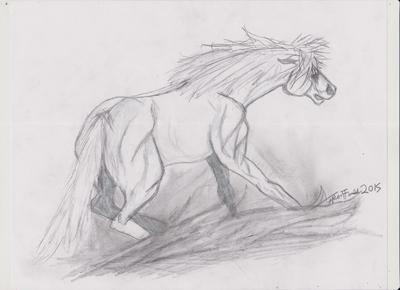 I like to see that there's a few other people that can draw! 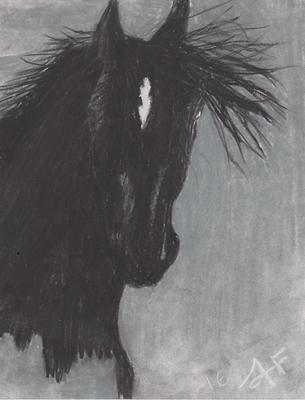 Mask is a drawing I drew with charcoal. If you like it or have something to say about it, please comment below and I'll be happy to comment back! The Mustang - I had a lot of people say it almost looks like it's actually moving... do you think so? 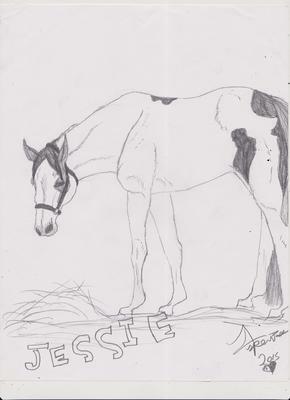 I drew this beautiful paint horse named Jessie James. For one I love that name and it fits him perfect! BIG CHEX TO CASH (AQHA/APHA) is the earner of $211,605 & 58.5 AQHA points (NRHA $185,050). 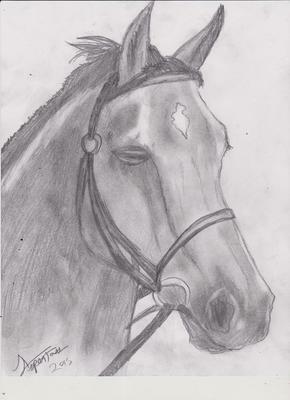 One of my favorite horses! Thank you and hope you guys enjoyed! 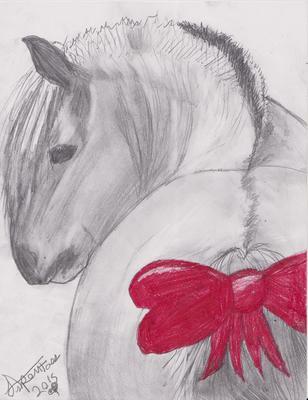 A few Christmas Horse drawings and my favorite Christmas poem! Enjoy And Merry Christmas!